Chris presents the Lookup Table Manager — a one-stop utility that allows data to be added into and removed from any of the lookup tables that populate your Access databases. I build a lot of systems that use combo boxes to select data. Typically, the data for the rowsource of the combo box comes from a lookup table like the one in Figure 1 (this is a Country table that I use quite a lot). Table 1 shows the structure of the Country table, which is typical of my lookup tables. Table 1. The tl_Country table. In fact, most systems I’ve come across use lookup tables just like this one (and often employ a great deal of them, too). The only problem is that it can be very time-consuming to write the code to manage the addition and removal of data in and out of all these tables. 1. I needed to be able to add or remove data from any of the lookup tables in a system using one form. 2. 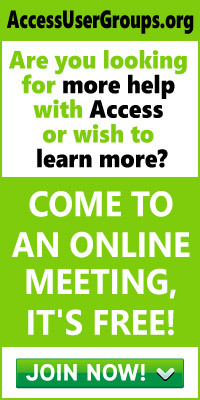 I wanted the form to be generic, so that I could use it in any of my Access databases. To start, I put together a separate table to hold details of all the available lookup tables in a system. I called it tbl_Lookup_Manager and gave it the structure shown in Table 2. Table 2. 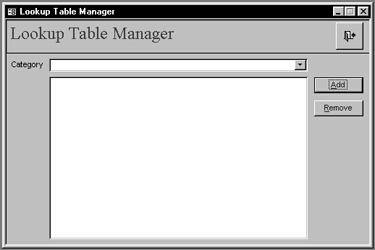 The Lookup Manager table. In tbl_Lookup_Manager, the Lookup_Tbl field contains the physical name of each lookup table in the database. I prefix all of my lookup tables with “tl_”, as it helps to distinguish them from other tables and objects (which makes my code easier to understand). The Category field supplies a more meaningful description of the physical lookup table name. For example, the lookup table tl_Country has “Country” in its Category field. The Lookup_Tbl_PK field contains the name of the Primary Key field for each lookup table. 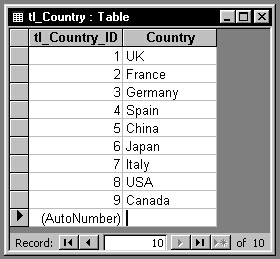 For the tl_Country table, this field contains “tl_Country_ID”. Similarly, the Lookup_Tbl_Data field contains the name of the data column within the table. Again, for the tl_Country table, this contains “Country”. For each lookup table in a database, I insert one record into tbl_Lookup_Manager (see Figure 2 for a sample of what the table looks like). So far, so good. At this point, I had a table of information where I could go to get structural information on any of the lookup tables in my system. Next, I built the form shown in Figure 3 to do the real work of inserting and deleting lookup records. To get the table’s attributes, I use the FindFirst method to locate the table’s record in tbl_Lookup_Manager, using the selected category from the form’s combo box as the criteria argument. The table’s attributes are then used to make a rowsource SQL statement for the list box. Here’s the code that does all that:Once the user selects a lookup table, I use the After Update event of the combo box to process the selection. The purpose of this process is twofold — first, to load the attributes of the selected lookup table into memory (using module variables), and second, to populate the form’s list box with the data in the selected lookup table. As you can see, the Lookup_Tbl, Lookup_Tbl_PK, and Lookup_Tbl_Data fields provide the information I need to display the table’s data. However, it’s when I process the changes to the data that tbl_Lookup_Manager really comes into its own. Because I know the actual physical lookup table name and the name of the corresponding data field within the lookup table, I can write some generic code to insert data into any of the lookup tables. Again, there’s a small problem to tackle at the end. The problem occurs when a lookup record that’s referred to by some other table(s) in the database is deleted. The solution is to declare referential integrity between the lookup table and all those tables that refer to it. With that done, I can add an error trap in the code to look out for a specific error number (3200, in this case) and respond to it. As an example, suppose that a table, tbl_Applicant, refers to data in one of the lookup tables, tl_Title. 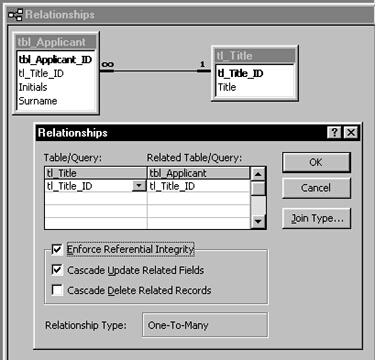 Figure 4 shows what tying the two tables together with referential integrity looks like in Access’s Relationship window. The aim of this article was to demonstrate that, by using some fairly simple techniques, I was able to build a quite useful utility for my Access applications. I not only shortened the development time for the project that first used this tool, but also for every project I’ve done since then. The next enhancement is a utility to run through the database, find all the lookup tables, and populate the Lookup Manager table. This shouldn’t be too hard to write if you follow a standard naming convention for your tables. The code for the current version of Lookup Manager is available in the accompanying Download file. Have fun!